Let’s take a quick flight to China. 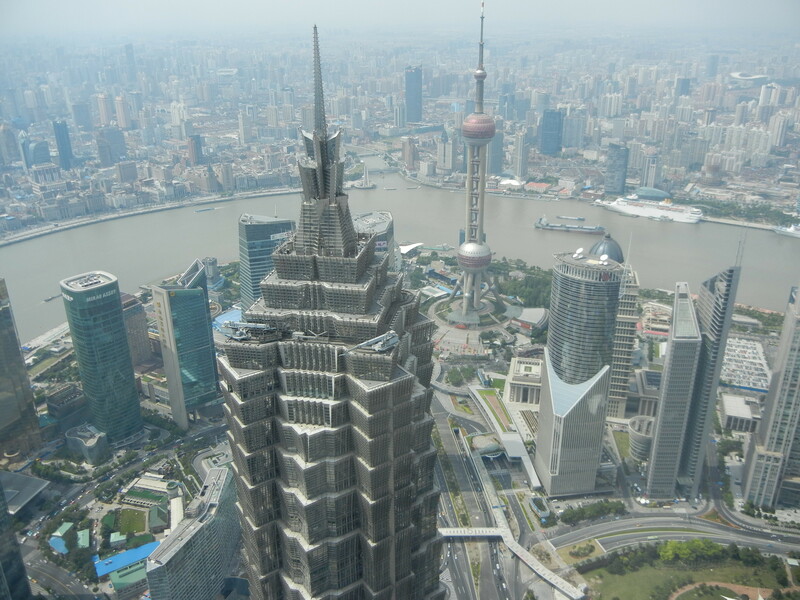 You can see ancient Chinese and modern global currents in China’s current tallest building, the Shanghai World Financial Center. 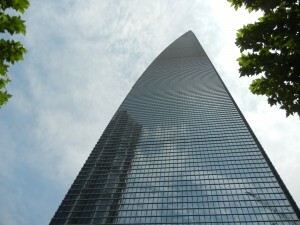 It soars up to 1614 feet in the picture above, and looms behind the Jin Mao tower (1380 ft). 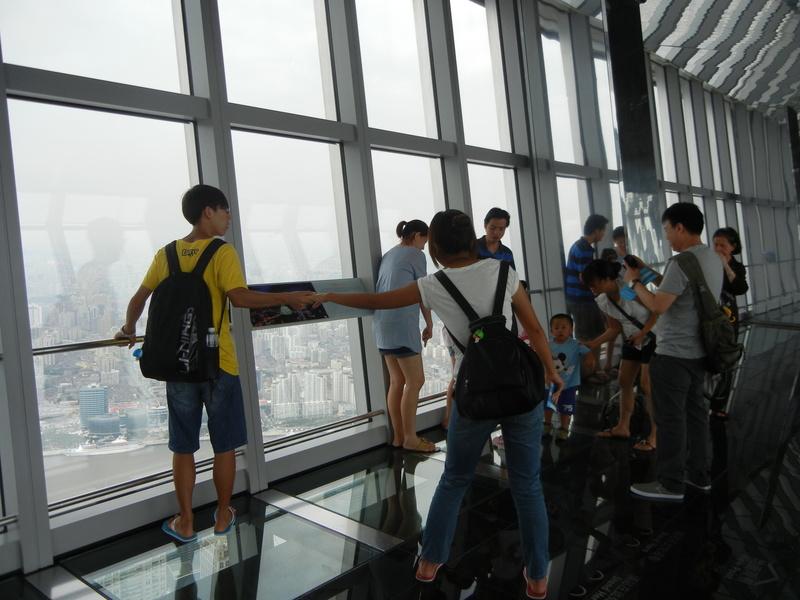 You can take its nosebleed elevator to the observation room over the empty space that you can see above the Jin Mao tower. Come along for a view of the modern city and the ancient past. 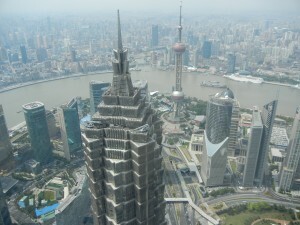 Shanghai’s pace of change is dizzying. Before the Jin Mao tower was finished in 1998, there were hardly any big buildings on this side of the river (called Pudong, or east bank). The Oriental Pearl Tower, where I took this shot from, shot up from what seemed like nothing but marsh in the 1990’s. But an even taller building than the World Financial Center is going up, the Shanghai Tower. It will peak at 2073 feet in 2014. 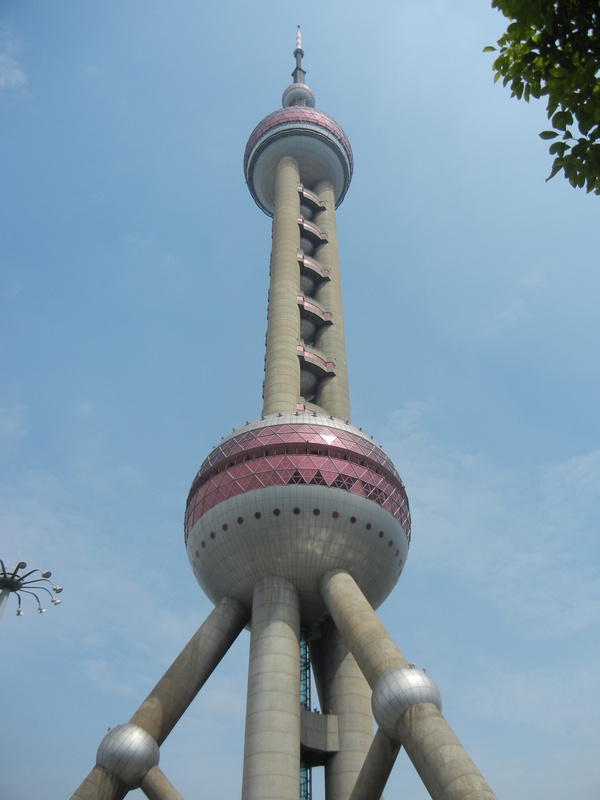 So the Oriental Pearl Tower (above) is on its way to being a museum piece. People in Shanghai thus aren’t quite adjusted to the fast pace of life. 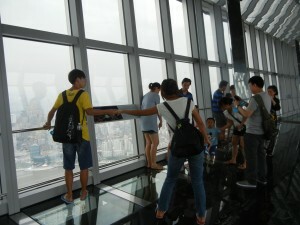 I saw many people hesitating to step onto the glass floor in the World Financial Center’s observation room. But the view is worth the rise in pulse rate. Some things in China don’t change though. The building’s forms follow ancient yin/yang ideas. This side balances sheer size with soft flowing curves as graceful as Chinese landscape paintings. It harmonizes masculine and feminine energies. And the Jin Mao tower is modeled after ancient Chinese pagodas. A cool thing about some of the great Asian skyscrapers is they follow traditional Eastern aesthetics, rather than the straight lines that Westerners have often found most meaningful from the pyramids of Egypt, to Greek temples, to Romanesque and Gothic cathedrals. 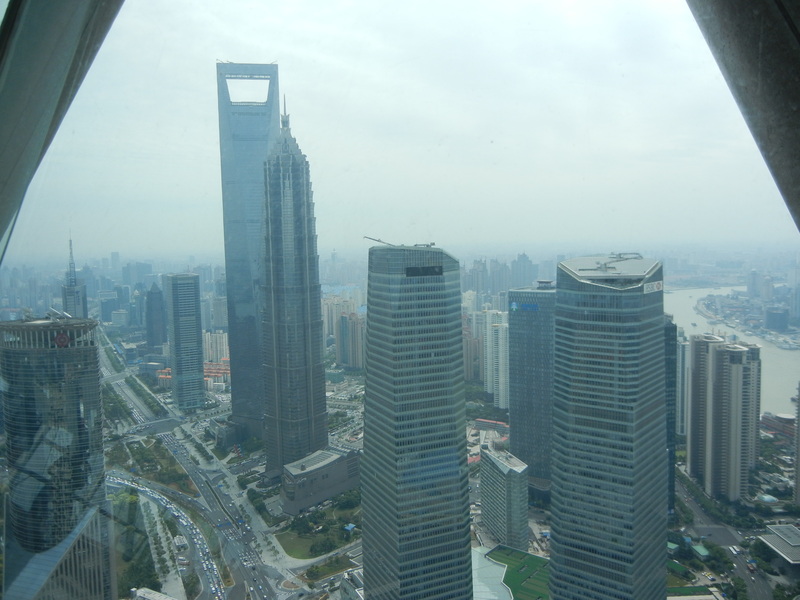 Yes, Shanghai’s World Financial Center was designed by an American firm, but the builders were commissioned to please their clients. Mission accomplished. People in Shanghai are very proud of their landmark skyscraper–at least until the Shanghai Tower eclipses it.